Shacknews defies gravity with Attractio, an upcoming first-person puzzle game by independent developer, GameCoder Studios. We got a first-hand look at the power of boxes. Developed by GameCoder Studios, an independent studio base out of Mexico, and published by Bandai Namco, Attractio challenges players with mind bending puzzles and malleable physics. Inspired by games like Portal, players are put in the shoes of a future reality TV show contestant, who must complete a series of deadly puzzles aboard a space station in order to win the grand prize. We recently got a chance to bend the laws of physics at the Bandai Namco Summer Showcase. Equipped with a number of gadgets, most notably a sort of gravity gun. Despite the nod to other games, Attractio's gravity gun doesn't work in quite the same way Half-Life 2's does. Instead of being limited to pushing and pulling, the gun can shift objects six different directions: up, down, left, right, push and pull. Additionally, I couildn't use the gun to carry objects around. Instead, it is merely used to direct objects, mostly boxes, toward different directions. The objects themselves seem to lose all sense of gravity and will float in whatever direction you nudge them toward. Maybe my gun needs an upgrade. There are also no half measures with the gun. Directing a box to float in a direction will make it move until a wall stops it. Finer manipulation means you have to set the box somewhere close enough to pick it up and move it by hand. For example, I had to position a box in front of a slot located at the opposite an acid pit. That meant pulling the box to me, picking it up, positioning it to line up with the slot, and pushing it into place. Unfortunately, the box doesn't become transparent when it's picked up, so alignment becomes a matter of guesswork. It took me a handful of tries to complete this one seemingly simple task. The demo I played involved a lot of box moving. I needed a box to climb onto in order to reach higher platforms and reach the gravity gun. It can be difficult to understand the physics that define how these boxes work. I could position one far over an edge, and as long as some of it rested on the platform, it remained fixed and sturdy enough to climb onto - as if it were somehow glued on magnetically attached. It might have just been the properties of the platform I was on, but the precariously positioned box was strong enough for me to climb onto and leap from to reach the platform holding the gravity gun. Although much of what I played involved shifting gravity-defying boxes around into correct positions, not every puzzle in the game is box oriented. 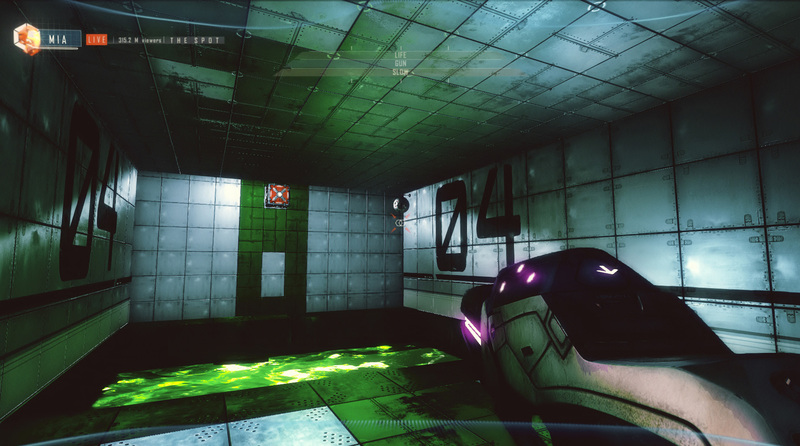 Players have access to other gadgets, like the ability to reverse a room's gravity so that the ceiling becomes the floor. I learned the hard way that switching gravity in the wrong place causes me to "fall" to my death. I didn't seen an objective tracker in the demo, nor was there a nudge by sarcastic observer to indicate where I should go. So it might be difficult to keep track of things in rooms with multiple puzzles, or a lot of moving parts. Especially since the puzzles will have multiple solutions to them. I also didn't get much of a sense that I was on a reality TV show. No host character explained the scenario, nor were there other competitors to race against. The game lets you choose from a three characters, but I couldn't tell if there were any skill differences between them, or if the selection is purely cosmetic - which would be silly, considering how you can't see your character, nor does s/he appear to speak with anyone. We'll find out more about this gravity defying puzzler as we draw closer to its release. Attractio is set to launch for PS4, Vita, and PC in January 2016.